I took a long winter break from blogging. While I missed keeping up with everybody and preparing great food to post, it was time to take "thyme" for me! My daughter and her family visited us over the holidays. It was so much fun to have both girls for the holidays and of course, adding a four year old to the mix made everything extra special. As usual, my son-in-law and I cooked together. It is so much fun for us to be in the kitchen preparing great food to share with one another. We have had the strangest weather...it can be really cold one day and the windows can be open the next. I am not certain what kind of weather to expect, how to dress for it, or what to cook! The one thing I do know is that the evenings are cold and comfort food fits the bill. This recipe originates from Julia Child and Jacques Pépin and was adapted before being featured in a the New York Times article. I have made it a number of times as it seems we have had leftover turkey or chicken on hand regularly! The New York Times has become my favorite source for cooking guides, new recipes and inspiration. I think I mentioned that in the past. Get on their mailing list, you will love the variety of articles and recipes! Prepare the crust: Combine the flour, butter, shortening, salt and sugar in the bowl of a food processor. Pulse together until the mixture is crumbly and butter is broken into small pieces. Pour 1/3 cup ice water into the bowl. Pulse 3 to 4 times. Test the dough by squeezing in your hand to determine if the clumps together and is evenly moist. If it is not, add and additional tablespoon of water, and pulse once or twice. Do not overmix so that the dough comes together in a ball. Turn the dough onto plastic wrap. Lift the ends of the wrap to bring the dough together inside. Press it into a large disk, wrap tightly and refrigerate until ready to use. The dough may be made up to two days in advance. Prepare the filling: Melt 2 Tbsp butter in a large skillet over medium-high heat. Add carrot, celery, leeks and tarragon and cook, stirring, until slightly softened but not browned (adjust the heat, as necessary, to prevent browning), about 3-5 minutes. Transfer the cooked vegetables to a bowl. Wipe out the skillet. Melt the remaining 3 Tablespoons butter over medium-high heat. Whick in the flour, and cook, whisking, until the mixture bubbles and smells cooked. Do let let the mixture brown. Whisk in 2 cups of broth. Cook, whisking, about 1 minute. Whisk in the cream, cook until thickened, about 2 to 3 minutes. Add the salt and pepper. If the sauce appears to be too thick, whisk in the additional half cup of stock/broth. Add the cooked vegetables, peas, chicken, and sauce to an 8-inch deep pie dish or small baking dish. Mix gently, adjust seasoning. Flour a work surface. Remove the dough from the refrigerator. Roll out the dough, turning and flouring often. Cut a shape approximately the size of your baking dish plus 1 1/2 inches overlap all around. Roll the dough up onto the rolling pin, and unroll evenly over the dish. Fold the edges under and crimp. Create hole vents near the center using a knife or a fork. Whisk the egg and 1 Tablespoon of cold water together. Using a pastry brush, lightly coat the crust with the egg wash.
Place the dish onto a baking sheet and place in the oven. Bake 20 minutes, then reduce the oven temperature to 350° F. Bake 25 to 30 minutes longer, until the crust is golden and the filling is bubbling. Allow the pot pie to rest for 10 minutes before serving. You won't regret making this tummy-warming dish! It is great comfort food. That is one fine looking pot pie Kathy and I love all of that crust - the crust is my favorite part of any pie. 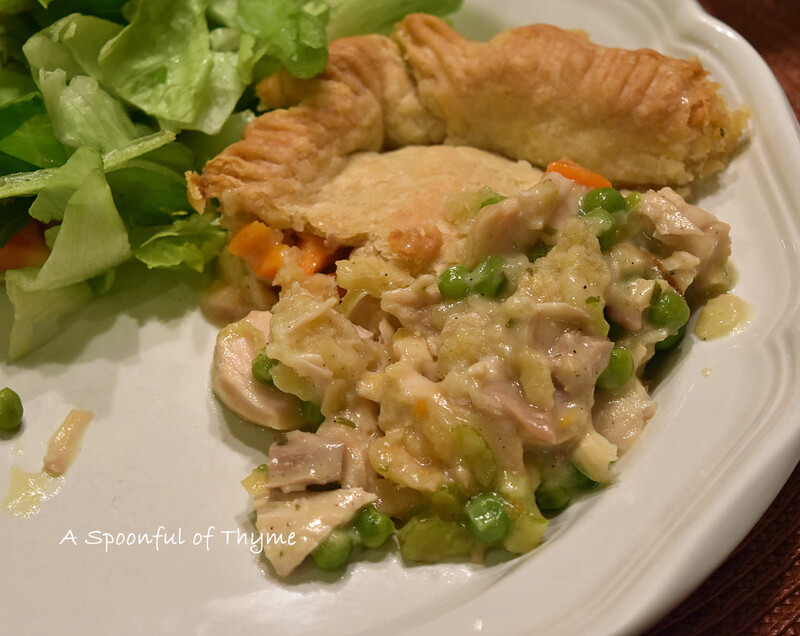 This will be a perfect day for your Chicken Tarragon Pot Pie, it looks delicious. Hope you are having a great weekend and thanks so much for sharing your awesome post with us at Full Plate Thursday. I love that you made this pot pie in a rectangular dish. Looks like more goodness for everyone. Thanks so much for sharing your recipe over at First Monday Favorites. 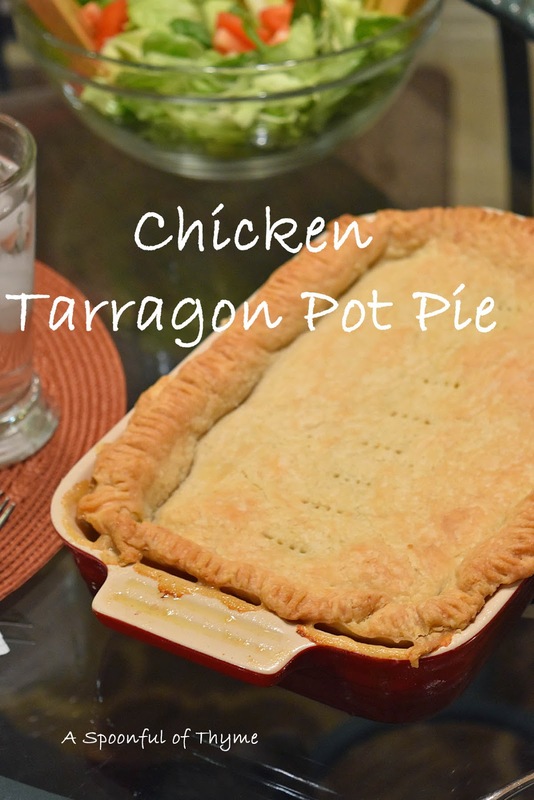 I do love a pot pie, and make it on a regular basis here, but had never thought of adding tarragon to it and I love tarragon. Thanks again. That looks delicious! I love the flavor of tarragon (and love the recipes from the NYT too).